Bath & Taps is a well-established Owen Sound business located in Springmount across from the Drive-in Theatre. Storeowner Jay Playford, has 38 years experience in plumbing and bath design. The store offers a complete concept-to-completion service and thousands of products from dozens of suppliers. A far larger product selection than would fit in a physical showroom. 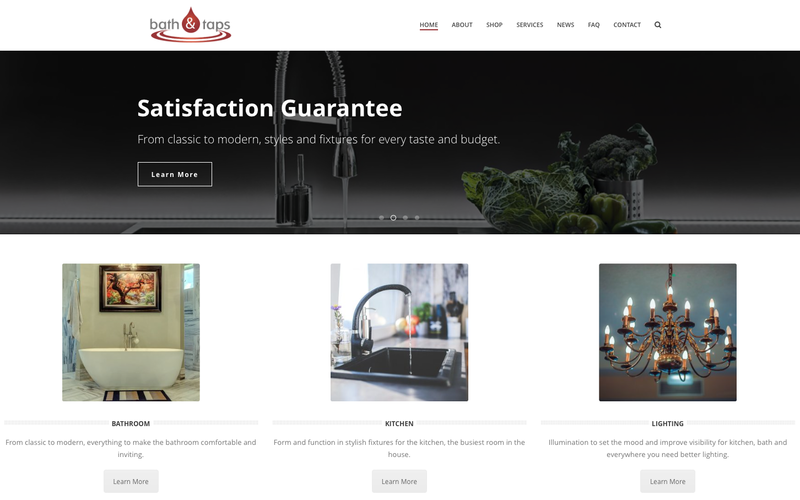 Bath & Taps has launched a new web site incorporating on-line shopping with a catalogue of almost 2,000 products and now offers customers one of the best product selections in Grey-Bruce. The “virtual showroom” complements the existing physical display area and establishes Bath & Taps as a regional business with customers coming from Collingwood the Huron Shore and tip of the Bruce. Leveraging his investment, Jay has utilized the site to launch his newest venture, Lighting Elegance that sells light fixtures for bath, kitchen and all other rooms of the house. The catalogue already boasts close to 700 lighting fixtures. Jay states his objectives for his on-line store and primary motivation for adding on-line retailing to his business. Bath & Taps is a great example for other local retailers considering on-line shopping. Having a clear vision of what the store should offer and committing the time to building an impressive catalogue, they demonstrate how a local business can compete with big box stores and provide more personal service. The web site was built on the Apex e-commerce platform by Owen Sound – based, Softext Publishing Inc.